Bone broth can be made with any kind of bones you prefer; beef, pork, chicken, turkey or fish, but the cooking time varies and they will all give a different nutritional value of your broth. The way the animals were raised also has an impact on the nutrition and personally I prefer using bones from grass-fed, healthy animals. 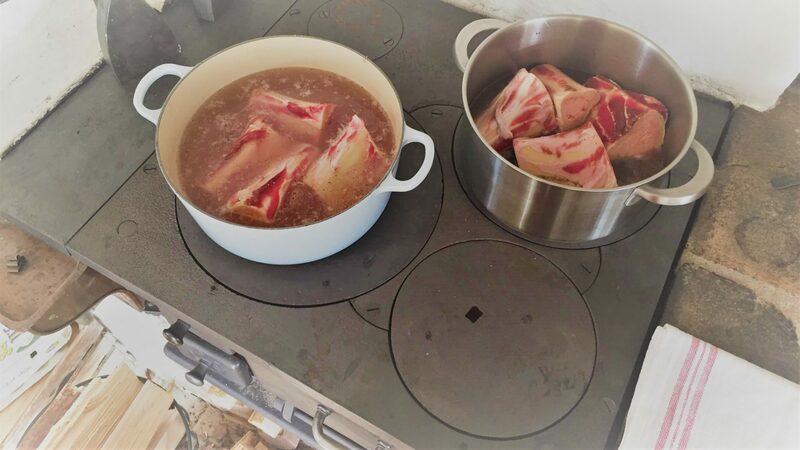 The idea with bone broth is that when cooking it on low heat for a long time, 24h – 48h, it allows for as much nutrition as possible to be extracted from the bones, compared to a regular broth which is more focusing on the flavor. Apart from many nutrients and minerals, you also get a good amount of gelatin and collagen from these bones. Collagen is a protein which is very important for us. It helps in healing wounds, repairing and building new cells, easier digestion, building up immune system and healing the gut from inflammation and other kinds of conditions. It will also make your skin, hair and nails look nicer! Actually about a quarter of our bodies are made up of collagen and this is something we naturally produce less and less of as we get older. Therefore it is important to make sure we get it from our foods in order to continue building new cells, repairing ourselves and ensuring strong bones. To us it sounds like the recipe for longevity! Get some bones from your local butcher or the supermarket. Wash the bones and put them in the largest pot you have or a slow cooker or similar. Fill up with enough filtered water so that the bones are just about covered. If you like you can add some pieces of onion, carrot, mushroom, celery or herbs (garlic, ginger, thyme, rosemary…) to enhance the flavor. Add a table-spoon of apple cider vinegar or lemon juice to the pot, and this is important, as the acid will help extract the nutrients out of the bones. Add some salt and peppercorns. Bring to simmer on medium heat, then reduce to the lowest possible heat (so that it is barely bubbling) and leave it with the lid covered for a day or two depending on what bones you are using. Let it cool down over night before storing it. When the bone broth has cooled down you will see a layer of fat on top, scope this out and put in a jar. You can use this fat for cooking or add it to a spread you’re making. The fat can be stored in the fridge a lot longer than the broth. Remove the bones from the broth and if using bone marrow, make sure to scrape out the inside as this is excellent nutrition! If you prefer a really clear broth, then strain it before pouring into recycled glass jars. Depending on the kinds of bones you are using, your broth might turn out more or less jelly. This is completely fine and depends on the amount of gelatin available in your bones. If you use parts with more connective tissues like feet, neck, joints etc. you will get a more jelly like texture. You can keep some of the broth in the fridge for about 5 days. The rest of a big batch should be stored in the freezer to use whenever you feel like it. It is a great addition to soups and stews, instead of the regular stock. You can also cook your rice or other grains in it to get a rich and warm flavor. If you feel like it you can also warm up the broth and drink it as it is. It works wonders as an evening drink as the gelatin will make you relax and sleep better. I love using bone marrow when making a broth as it gives us all the extra goodies from the inside. This is considered a delicacy in many cultures and I remember having eaten it myself in some fine restaurants. Historically it has always been valued as extremely nutritious food and was not to be forgotten when hunters brought home wild animals. Bone marrow mostly consists of fat (the good fat! ), which as such is beneficial for us, but also brings a lot of other benefits for our bodies. It helps digestion and is super healing for any kind of gut issues, like leaky gut, irritable bowels syndrome (IBS), gluten intolerance or other kinds of inflammation related conditions. Bone marrow contains the essential nutrients collagen and gelatin which helps repair and rebuild the body. It’s also full of minerals such as calcium, magnesium, and phosphorus. Whenever we roast a whole chicken we also make sure to always “recycle” the bones and make a broth out of it. Once all the meat is carved off we put the leftovers in a big pot and assume all the steps above. Now go and make some anti-inflammatory bone broth which will make you feel and look good, both on the inside and on the outside!